Here is the Wee Care gown finished and ready to ride to the fair. I delivered it yesterday. It is made from silky voile. I had just barely enough scraps left from the last christening gown to squeeze this out. It is my new favorite fabric. 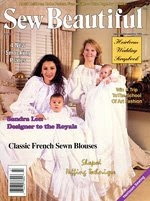 The gown pattern itself is another favorite. 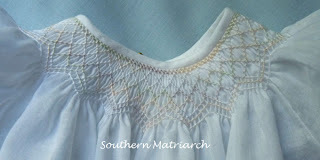 It is Mother of Pearl/Oyster from Australian Smocking and Embroidery Issue #29 by Robyn Beaver. I have used it for not only Wee Care but for many newborn baby gifts. It is a tried and true. The original smocking design is done on linen. I have always wanted to do this gown so I chose it for the gown I planned to enter in the fair. 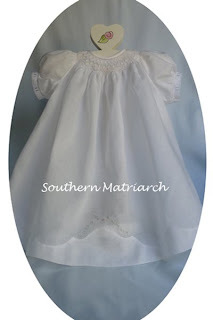 It would be a beautiful design to use for a christening gown. 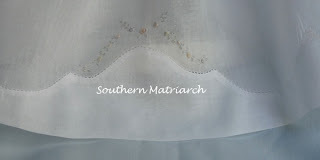 The smocking is stitched with overdyed floss by Needle Necessities. That company has sadly gone out of business but there are overdyed flosses available from other sources now. Cross stitch and needlepoint shops are a good place to look for it. The colors I used were very pale so it gives a very subtle yet colorful effect. Now lets see if it bring home a ribbon. The Wee Care gowns entered into the fair are donated to the university hospital. I hope it brings comfort to a hurting family. You've won first place in my judgement! Thanks Julia. I have it on good authority that it did! Martha, your gown is beautiful! I hope it wins "Grand Prize!" Thank you Cheryl. It did get Best of Show for the smocking category. I got an email last night. I too have always wanted to make that gown. I think it would be a lovely christening gown. I'm a sometime smocker and mother of a child who was in the NICU for 4 weeks. Blessedly, she is healthy and kicking up a storm. She was 7 weeks premature and this post and concept brings tears to my eyes. Thank you for making this gown and bringing this to my attention. By the way, we're both Martha's. Martha....Gorgeous gown. Glad you won Best of Show for it. You deserve it!!! Love your blog! I need a madeira hem tutorial. I am doing something wrong when I put the scalloped piece on the dress, I can't get figure out which way it goes. Please help, I am making the Trinity Cross blessing gown from Martha Pullen. Thanks for answering so quickly. Your blog is the greatest! Somehow it should be cataloged to be used with a search button. That is the librarian coming out of me but I lack to technical skills to do it. Someday I will get to go to a SAGA convention and have a chance to thank you in person.